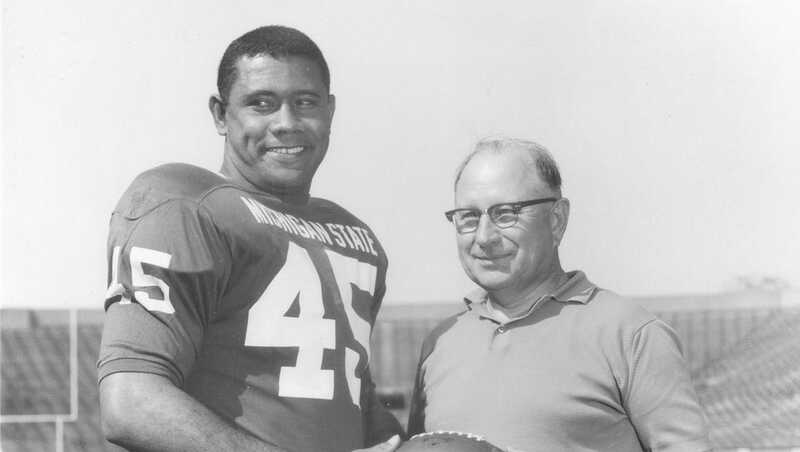 Michigan State All-American fullback Bob Apisa missed the 1966 Game of the Century with a knee injury, but decades later he tucked the game ball under his arm for one last carry. It was a house fire he escaped rather than Notre Dame’s tacklers. How Apisa ended up with a game ball from a contest he didn’t play in is a long and winding road of serendipity. It inspired him to donate the ball back to Michigan State in 2014. “The ball belongs to Michigan State, my teammates, my coaches and the student body that supported us unconditionally,” Apisa said. Apisa’s run from his burning Granada Hills, Calif., home in 2011 preserved a piece of history from one of modern college football’s seminal moments. The Spartans and Notre Dame played to a controversial 10-10 tie before a record TV audience of 33 million in the pre-Super Bowl era and 80,011 fans packed into 76,000-seat Spartan Stadium. The game ball now rests on display at the Duffy Daugherty Building with other museum pieces, trophies and photos from Michigan State lore. The ball’s journey began that fall afternoon on Nov. 19, 1966. In a sense, as a result of the tie the ball was homeless. The custom after a wins was for Michigan State head coach Duffy Daugherty to award a ball to the game's star. But with the disappointing tie, he handed it to long-time equipment manager Ken Earley to put it away. It took years for Michigan State to overcome the disappointment from the tie that amounted to a loss for a team ranked No. 2 to No. 1 Notre Dame. Entering the game, the AP and UPI polls both ranked Notre Dame No. 1 and Michigan State No. 2. After the game, AP kept Notre Dame No. 1 but UPI bumped Michigan State to No. 1. However, Notre Dame had one more game to play, which was part of Notre Dame head coach Ara Parseghian’s gamble to play for a tie. The Irish routed USC 51-0 a week later in Los Angeles. AP and UPI both voted Notre Dame No. 1. But gained a share of the national title through the National Football Foundation’s MacArthur Bowl. It recognized the 10-10 on the field and identical 9-0-1 records and named the Spartans and Irish co-national champions. Meanwhile, the ball remained tucked away with Earley, a fixture on campus as equipment manager. With time, the players began to accept that the 1966 Spartans are remembered like no other No. 2-ranked team. They were led by four College Football Hall-of-Famers: Bubba Smith, George Webster, Gene Washington and Clinton Jones. At a 25th anniversary of the Game of the Century gathering of players in 1991, Earley told Apisa to expect a package when he returned home. Apisa opened the box to find the 1966 game ball. Grass and mud stains still marked the ball from its afternoon in history. Earley felt Apisa deserved the ball. He had witnessed a magnanimous moment from Apisa midway through the 1966 season when he gave away the game ball Daugherty presented him from Michigan State’s 20-7 win over Michigan. On Apisa’s way out of Spartan Stadium after the Michigan victory, Apisa encountered a father with his son in a wheelchair. They had been waiting for Apisa to get his autograph. Apisa decided to sign the ball and give it to the young boy. But Apisa, who first injured his knee in his sophomore 1965 season, missed the last three games of the 1966 with another knee injury. The injuries plagued the two-time All-American as a senior and short-circuited his NFL opportunity. He never earned another game ball. Earley considered all this after he had held the ball for 25 years. He told Apisa not to tell anyone about his gift to him. Earley passed away in 1997, freeing Apisa to tell the story. The house fire and work he started in 2012 with his Hollywood background to produce “Men of Sparta,” a documentary on the 1965-66 Spartans that led the integration of college football, inspired him to donate the ball back to Michigan State. On a game-day Saturday in 2014, Apisa presented the ball to Michigan State Coach Mark Dantonio at a brunch president Lou Anna Simon hosted at Cowles House on campus. After the brunch, Michigan State’s band warmed up on the field next to Cowles House. Apisa and others watched and listened when leaves began to fall on Apisa. He looked around and noticed only the branches above him shed leaves. Apisa soon found himself holding a new game ball after Michigan State defeated Michigan 35-11 at Spartan Stadium. Dantonio, Simon and athletic director Mark Hollis presented Apisa with a game ball. The two-time All-American that made history at Michigan State as the first Samoan All-American had a game ball to cherish again. The story comes full circle with another chapter for this week’s for 2016 homecoming. Apisa is part of a panel of players recognizing the 50th anniversary of the Game of the Century Wednesday night at Conrad Hall. On Thursday night, “Men of Sparta” will be shown at Wells Hall. “It’s gratifying to bring this all home,” Apisa said.